Dr. Sandra Vergara, was born in Cali, Colombia. She attended The Colombian School of Medicine , El Bosque University School of Dentistry, in Bogota, Colombia, where she earned her DDS degree and completed her 4 years of Oral and Maxillofacial Surgery Residency in 1996. 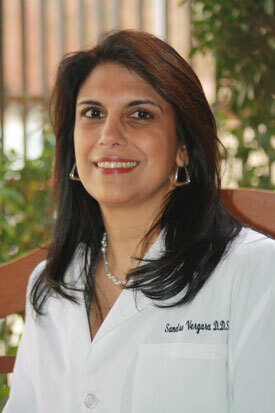 Following her surgical training in Colombia, Dr. Vergara went to Southwestern Medical Center, Parkland Hospital in Dallas and Vanderbilt University Medical Center in Nashville, and completed a six months Fellowship in Oral and Maxillofacial Surgery with emphasis in Surgical Treatment of Temporomandibular Joint Disorders. Following these programs she returned to Colombia to run a successful private practice in Cali. She also joined Rafael Uribe Uribe Hospital as a Clinical attending and professor during 4 years. In 2001, Dr. Sandra Vergara, returned to Nashville and joined Vanderbilt University Medical Center, to completed her second Residency program in Oral and Maxillofacial Surgery under Drs. Samuel McKenna and Scott Boyd where she earned a Specialty Certification in one of the best accredited programs in the U.S., obtaining excellent credentials and experience. After completing this program, she moved to the Wichita Falls area and entered into private practice, for over ten years now. Dr. Vergara, is the only female Oral Surgeon in the great Texoma area. She understands how the dental and surgical areas involved in her profession require expertise, organization, discipline and compassion. In her private practice, Dr. Vergara practices the full scope of oral and maxillofacial surgery with emphasis in dental implant surgery, temporo-mandibular joint, oral pathology, orthognatic surgery, facial trauma, and dento alveolar surgery. Dr. Vergara, has hospital privileges at Kell West Regional Hospital and at Baylor University Medical Center in Dallas. Dr. Vergara, is a dedicated mother of two children, Juan Pablo and Maria Alejandra, and has many interests outside of her specialty. She enjoys swimming, scuba diving, traveling and spending time with her children in their activities. She is very involved in Church activities and is a partner in education of two public schools here in Wichita Falls.